Yesterday, I visited the Akron Art Museum to see an exhibit on portrait painter Chuck Close. Upon entering the Museum I was attracted to an exhibit called Nuclear Enchantment by photographer Patrick Nagatani. 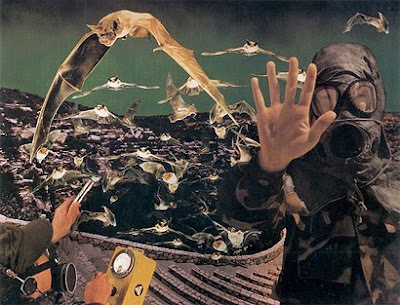 Both the name and the photo of the post apocalyptic bats were quite intriguing. However, the exhibit itself provided a rather interesting surprise as aircraft models were featured in many of the photographs. Here you can see the very old Hasegawa kit of the F-117. 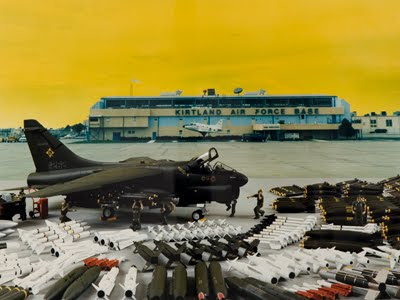 F-111s galore at Cannon AFB. 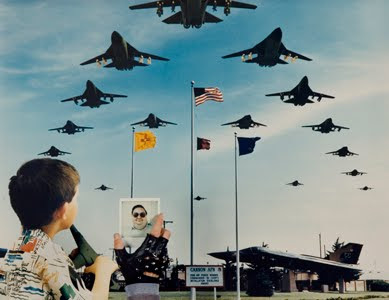 My favorite was the B-36 on Meccano cradle photograph. Some of the other models are in the background, and you have to love the mushrooms. I fall into the school of thought that even nicely built plastic models are not art. However, it is really nice to see plastic models in art. As someone who has struggled to create decent model photographs, it amazing to see how a real artist can use model airplanes to create something thoughtful that is on display in a major art museum. James May Toy Stories - Airfix!